There are currently 10 different MMO game launchers on my desktop, or technically 13 since the Arc launcher covers three games (Star Trek, Champions, Neverwinter) and Glyph has two (Rift and Defiance). Out of that list of 13 games, Star Trek Online is the only one I’ve played with any regularity this year. Most like Marvel Heroes and Firefall I occasionally get an urge to jump into, but there’s only two that I get nostalgic about and am considering trying to reconnect with: LotRO and Champions. Lord of the Rings Online was my first ever lifetime subscription purchase. It was the first game that I ever hit max level with a character. As a Tolkien fanatic, it’s probably the closest I’ll ever get to walking in Middle-Earth without taking a trip to New Zealand. Sadly though the game’s graphics haven’t aged well, especially the character animations which were always the weakest part of the game. Every time I log into Landroval, it seems like I spend a couple of hours reassigning refunded specialization points and legendary item points, before playing for a little bit and then logging out for another long absence. The recent server closure announcement has me wondering if I should refocus on the game if for no other reason than to get my main/original launch character, Brynulf, back to max level. Head south and see Isengard and Rohan at least once. Champions seems to be mostly on maintenance mode now. Perfect World isn’t really pushing the game even within their own launcher. Arc’s Games tab currently has eight games rotating through, both Star Trek and Neverwinter are the first two and Champions isn’t even in the list. Most of the news on the site is about sales and lock boxes. The one piece of news that is content related mentions revamping the event system to make sure that they are more regular running. Despite all that, I have a lot of fondness for the game. While City of Heroes was my first super hero MMO, I never liked how powers were restricted by archetype. Champion’s free-form system was so much more interesting to me because I could more easily make thematic builds. Truth be told, I also like the graphics better in Champions, which I didn’t expect to originally. I’ve tried a few times before to get back into the game, but always by picking up on of my current characters, and it’s never worked out. Too many systems in the game have changed to jump back into the middle of things. So, if/when I do try next, I’m going to roll up a new hero and see if I have better luck. Middle-Earth travel plans delayed slightly. The Riders of Rohan expansion snuck up on me. Despite reading dozens of articles and seeing lots of mentions on Twitter, I didn’t actually realize how close the launch was until Sunday night. I was catching up on my news and saw the goodie bag reminder from Goldenstar, so I logged in to reopen my home and do some preparation on my main and a couple of alts. I had planned to log in last night to behind my adventures among the Horse-lords, but it was taking so long to patch the expansion (wish there had been a pre-patch available) that I decided to play some Dishonored while I waited. The next thing I know it’s 1 am. 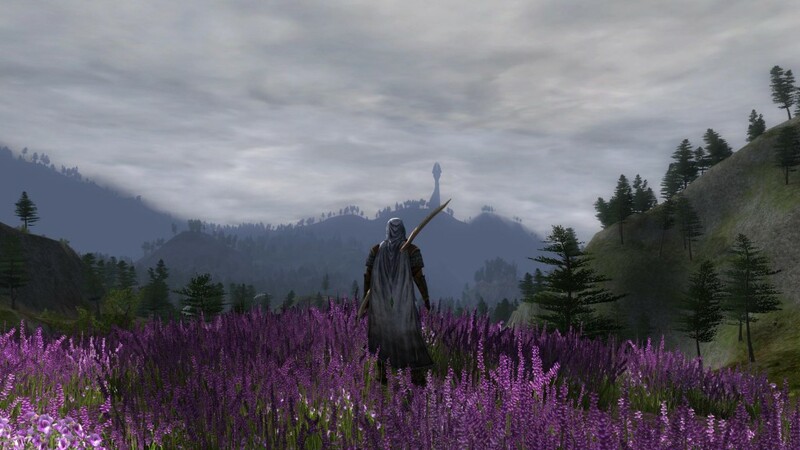 When Rise of Isengard launched, I ended up making only a brief trip to Dunland where I did a little sightseeing and then headed back to Mirkwood and Dunland to finish the Epic Story quests that I’d skipped. It was nice being in Mirkwood and Enedwaith which were fairly quiet while the launch crowds were in Dunland. My current plan is to do pretty much the same thing with Rohan. During my last period of LotRO focus, I’d gotten to the border between Dunland and Isengard before being distracted by Skyrim, and I’d like to avoid opening gaps in my Epic Story quests on my main character (who’s the only one above level 30). There’s a decent chance though, that I’ll have so much fun with mounted combat that I won’t want to head back. Besides the mounted combat, I’m really looking forward to seeing Turbine’s open tapping implementation and how well it works compare to what I’ve gotten used to in Guild Wars 2. I hope that it is so well received that Turbine applies it to old zones as well, even though I realize that’s a massive amount of work. ArenaNet’s design has led to a very cooperative and mostly friendly community, at least in my experience, and I would love to see that same spirit brought to Tolkien’s world as well. Couple of things I wanted to mention. Had you told me last year that I would still be putting hours into Mass Effect 3’s multiplayer game, I would have said you were crazy. Yet that’s exactly what I’ve been doing, even though I’m not typically a fan of shooters. Why? Two reasons that I’ve come up with. First, I really love the ME universe and the multiplayer is a way to stay engaged with it. Second, I’ve come to realize it isn’t actually the shooters that I dislike, it’s their competitiveness. ME3’s is cooperative against bots. After hundreds of matches, I’ve yet to run across any of the type A-hole personalities that I associate (rightly or not) with games like Call of Duty, Modern Warfare, or Counter Strike. Guild Wars 2 has its head start this weekend. I’m excited to play but it’s a low-key kind of excitement. I’m looking forward to playing but if ArenaNet came out tomorrow and said they were delaying headstart for a week or a month, I wouldn’t mind in the slightest. I haven’t been thinking about the game much, or keeping the patcher updated, or coming up with the character names I want to use. Yet I am excited enough that I’m planning to stay up late and to try to get into the headstart as early as possible. Possibly my excitement has been blunted by getting to play in a few beta weekends (the stress tests always happen when I’m working). I’ve already had the chance to explore the starting areas and try out different races and classes. I’ve already settled on an Asura Elementalist as my main (at least initially) and the guild I’m planning to join has already chosen a server. LotRO delayed its expansion until October. I’ve seen a lot of surprised comments about that. I’ve also seen a few comments believing that it was done to fix bugs and improve the game a bit more before release. I’m sure Turbine will use the extra time to improve the game, but I don’t think that was the reason for the delay. September is already super crowded and since Blizzard has already set their expansion date in an effort to compete with ArenaNet, it would be stupid of Turbine not to push the release a bit and give themselves more space.